Evan is President and CEO of Canada Mortgage and Housing Corporation (CMHC), a role he has held since 2014. Evan leads a team of housing experts who share a single mission: to help Canadians meet their housing needs. As CEO, Evan is especially passionate about growing leaders, and the merits of both a diverse workforce and the mental health of his colleagues. Evan and his executive team have transformed CMHC into a high-performing, innovative, and ambitious organization with a vision of being at the heart of a world-leading housing system. CMHC has led the design of Canada’s first-ever National Housing Strategy, an ambitious $40 billion, 10-year plan to reduce housing need in Canada. Evan came to public service after visiting Canadian battlefields and Vimy Ridge in northern France. He served first at the Bank of Canada, at the behest of former colleague Mark Carney, in 2010. 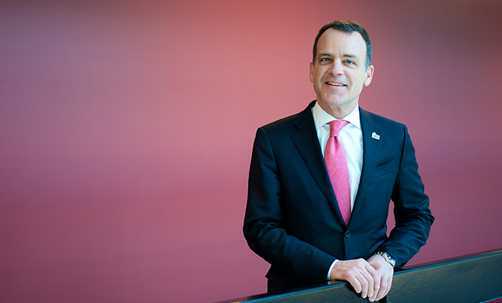 Taking lessons from the global financial crisis of 2008 and his career in finance, Evan spearheaded the Bank’s efforts in establishing financial infrastructure to guard against systemic risks. Evan worked at some of the world’s largest investment banking firms in Canada and the United States before joining the Bank. He also helped launch a private entrepreneurial venture, Side Launch Brewing Company, named 2016 Canadian Brewery of the Year. Diagnosed with early onset Parkinson’s disease in 2015, Evan is an advocate for healthy living. Inspired by the legendary cyclist Davis Phinney’s mantra to “live well today,” Evan is a member of Davis’s foundation board and co-founded the Growling Beaver Brevet cycling fundraiser. He is an avid cyclist, a voracious reader, and a lifelong downhill skier. Evan wants to speak French better, lose his airline status, and one day write a book — in English. He has two grown children, and splits his time between Ottawa, Toronto and Collingwood, Ontario. "I have often said that this is the best job I’ve ever had – the most exciting, most challenging and most fulfilling. I am both thrilled and honoured to continue working with CMHC’s dedicated and talented staff across the country as we strive to make a difference in the lives of Canadians."